Gangtok, May 25: Bhaichung Bhutia is all set to formally launch his Hamro Sikkim Party on May 31 in a bid to challenge the ruling Sikkim Democratic Party (SDF), which has been in government in the state for close to 25. Talking to The Telegraph, Bhutia said the SDF was increasingly becoming dictatorial and the people of Sikkim, particularly the youths, were looking for a change. "We are looking for a change. The youths of Sikkim are definitely looking for a change. From a democratic front, it (SDF) has become a dictatorial front. Corruption is rampant here...If anyone speaks, his voice is suppressed. This is not good for Sikkim," he said. Bhutia alleged that Sikkim has been denied even basic facilities during the long rule of the SDF. "They speak of development, but basic things like roads, electricity and water is not there. Roads in Sikkim are in a very pathetic condition, drinking water is a problem, despite having so many hydel projects, load-shedding takes every now and then," he said, adding that even the much needed revenue was yet to be generated from about 30 power projects operating in the state. The party will be launched at the remote village of Daramdin in West Sikkim in the presence of a promised 15,000 to 20,000 supporters. Significantly, though, the party is unlikely to announce the name of its president at the launch. "In time we will announce," was what Bhutia said when asked who would be the party president. While announcing the name of the party in Delhi on April 26, Bhutia had indicated that he wouldn't be the president and someone "clean and credible person" will be helming it. Bhutia didn't confirm, but sources said there could be as many as seven vice-presidents representing different communities of Sikkim. Bhutia, Lepcha and Nepali are the three major communities of the state, but within the larger Nepali-speaking community, the Limbus and Tamangs, by virtue of they being Scheduled Tribes, have a separate political identity. West Sikkim has the biggest presence of Limbus in the state. Bhutia, who had a rather inglorious innings in neighbouring Bengal, said one of the reasons for launching the Hamro Sikkim Party was to motivate "good people" and youngsters to take to politics. "Only complaining about how dirty politics is will not help. If we want to change politics, we must be part of it," he said. Asked about his links with the BJP and the relationship his party will have with other opposition parties in the state, Bhutia said for starters the party will focus on setting its own house in order to make the party strong. "We then can decide on coalition with any party. BJP already has a tie-up in Sikkim with the SDF. SDF is part of North East Democratic Front formed by the BJP. Once they break the alliance, we can think and consider," he said. 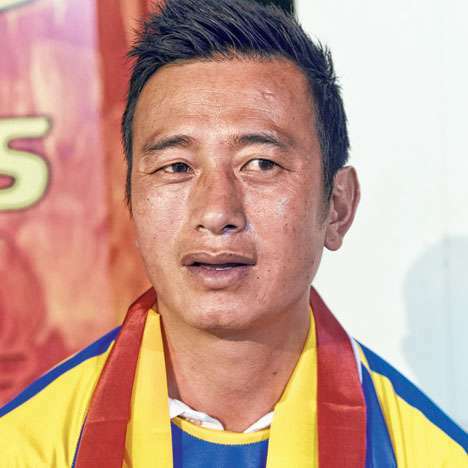 Bhaichung Bhutia is all set to formally launch his Hamro Sikkim Party on May 31 in a bid to challenge the ruling Sikkim Democratic Party (SDF), which has been in government in the state for close to 25.